An exclusive collection of ethnic and fashion Indian jewelry, Indian dresses and Home decorations. We offer an eclectic collection of Indian clothing right from Saree, Salwar Kameez, Lehengas, Indo-western wear to Footwear, Handbags and Accessories to match. Uncover a range of Indian fashion outfits and bridal wear handpicked from all corners of the country, reflecting the vibrant colors of India. Inspired by both traditional Indian and dynamic Bollywood designs, our collection of designer jewelry displays a wide range of style. At Taj Fashion, you would be spellbound by the varieties and collection of Indian jewelry. Planing for the party at your home or going somewhere. From friend's celebration to a charity event, these dresses will make you shine in each occassion. Don't worry about size, we will get it customized for you. The Indian attire of choice for every women, Lehenga. The ease of wearing and flexibility of mix and match Choli makes Lahengas more popular. Lehengas are intergral part bride's wardrobe on Indian wedding. You will find wide range at Taj Fashion. Salwar Suits perfectly cater love of Indian women on variety, colors, prints, comfort, versatility, styles and patterns on their dresses. The favourite style of ethnic suit adored by everyone is the Anarkali suit. Punjabi salwar kameez is next. At Taj Fashion, we gurantee to find the one which goes with your personality. There is no doubt that ladies have more choice when it comes to Indian clothing. At Taj Fashion though we do bring the clothing choices to men too. Come to our studio in Austin to see and experience the elegance of Sherwani, Kurta, Dhoti, Safa (Pagari), Mojari (Shoes) and anything else you like to wear. When mom and dad are going in style, you don't want your kids to look different. Come to Taj Fashion and we will make them Rajkumar and Rajkumari. 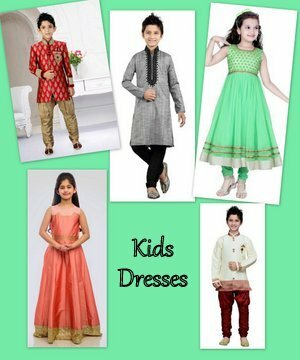 From girls Chaniya Choli to boys Dhoti Kurta, we have kids mojaris too. We also offer custom and pre-ordered dresses for kids from India. At Taj Fashion we pride on bringing largest selection of kurtis and blouses in Austin. Hundreds of varieities to choose from. From size S to XXXL, we have blouse and kurtis for everyone. Our readymade blouses are best quality fabric with perfect stich. 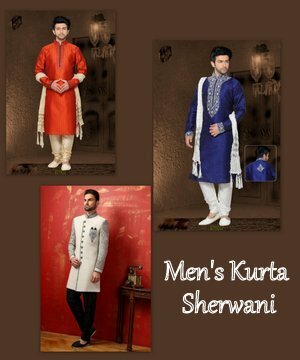 Kurtis are both casual and formal. Bindi, Bangles, Bags and Beauty.. Traditionally Bindi is a bright dot of red color applied in the center of the forehead, now it consist of vibrant colors and various designs. At Taj Fashion, we bring matching ornaments beautifying you from head to toe. Dance costumes & Custom Dresses.. Variety of costumes for performances to rent or buy. Dancing scarves, wings, eye masks and tribal dresses from India. We can provide group dance costumes custom stitched. Also available musical instruments from India ! Bought a new home or want to change the style of your home in Indian way. We have bed spreads, Indian pillows, torans, Ganesh wall planks. We also carry large selection of return gift items, starting from $3. 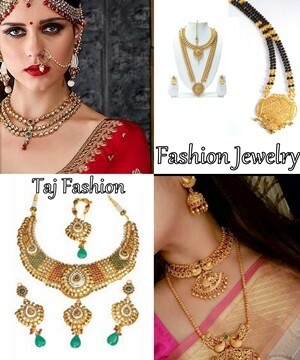 Taj Fashion is Indian clothing and jewelry store in Austin, Texas. We bring exclusive Indian clothing, ethnic jewelry, handicrafts and home decorations from India to Austin. Our products are directly sourced from manufacturers. This gives us ability to provide designer apparel like Salwar, Lehanga, Saree, Accessories and home decor items at lowest price. 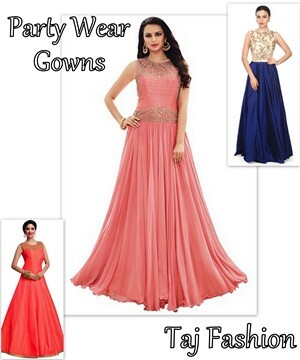 We also offer custom made and ready to wear Indian fashion dresses.